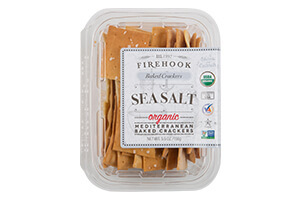 All Natural, baked from scratch Sea Salt Mediterranean Crackers are an ideal crunchy accompaniments to your cheese, pate, salami, hams. They are also a fantastic snack, just the way they are, straight from the package into you mouth. Irresistible. Firehook Bakery was established in December 1992. The founders longed for a neighborhood bakery that reminded them of their hometown village bakers. They wanted an authentic local establishment that caters to the specific needs of their neighborhood customers. So, after encouragement from their families, they mixed their passion for baking with some planning and fired up the Firehook ovens. 21 years later, Firehook is still family owned and the founders are grateful for the continued support from the extended family of loyal customers and passionate bakers. Ingredients:wheat four, sea salt, honey, yeast, olive oil. These are some of the best crackers I've ever tasted. They are crispy enough to support any kind of cheese, dip, or other spread, and they are so subtly flavored that they do not influence the taste of whatever is put on them at all. ai love them by themselves, just plain and simple, with soup, salads or anything else.